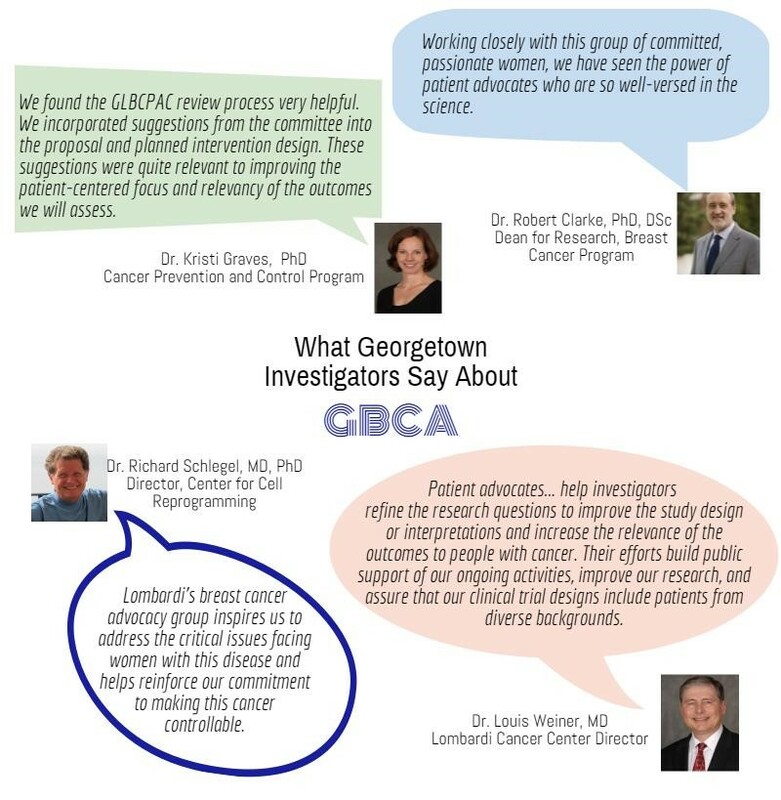 We act much like a shared resource to both clinical and scientific researchers at Georgetown-Lombardi. We can provide a letter for inclusion on grant proposals indicating our availability and willingness to meet with you to discuss your project throughout your research. (This letter would not indicate our endorsement of your proposal, but rather our availability to consult with you should the need arise.) Please allow two weeks before grant deadline for letter preparation. We love to meet with you early in your project design. We are happy to invite you to a monthly meeting and provide you with a patient’s perspective after a brief presentation and discussion of your project. 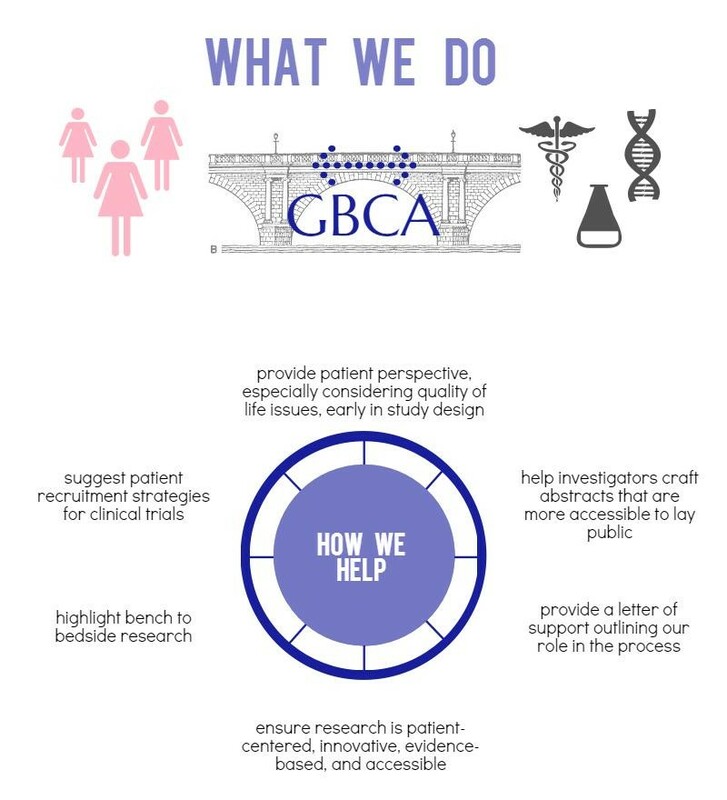 If the group agrees, we will provide a letter of endorsement of your project, indicating your willingness to work with patient advocates and our ongoing commitment to work with you throughout the duration of your project. Please notify the scientific adviser of your desire to be placed on our schedule at least six weeks in advance. Several grant mechanisms require a higher level of involvement from a single advocate through the entire life cycle of a grant. In that case, the group will discuss the project after an initial presentation at our meeting, and we will put forth a nomination for your consideration. Unfortunately, any individual advocates must be nominated by the group, and we are not able to honor requests to work with specific advocates. Because these mechanisms require advocate involvement during the preparation of the proposal, it is critical that the scientific adviser is notified as soon as a decision to apply has been made. Not writing a proposal but still want to chat? Come to a meeting and bounce an idea off of us! We are here to speak with researchers at any stage of a project, even when you aren’t quite ready to put together a grant. We promise not to suggest experiments, but we love to talk about big picture questions and help researchers think of ways to expand the impact of their ideas. Talk with our scientific adviser to be placed on the schedule for an upcoming meeting.